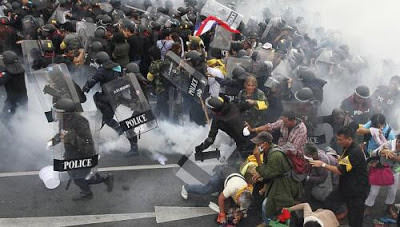 BANGKOK (AP) – Anti-government protesters calling for Thai Prime Minister Yingluck Shinawatra to step down launched a rally in Bangkok on Saturday that authorities feared would grow into the biggest demonstration the country has seen since she took office last year. The rally, which was expected to draw tens of thousands of protesters, was mostly peaceful in its early stages. Police, however, fired tear gas to disperse between 50 to 100 people who tried to break through a line of concrete barricades erected on a street near the protest site. Earlier in the week, Ms Yingluck ordered nearly 17,000 police to deploy and invoked a special security law, citing concerns that the rally could turn violent. She also accused demonstrators of seeking to overthrow her elected government. The demonstration underscores the still-simmering political divisions that have split the country since the army toppled her brother Thaksin Shinawatra in a 2006 military coup. Saturday’s protest was organised by a royalist group calling itself “Pitak Siam” – or “Protect Thailand.” Led by retired army Gen. Boonlert Kaewprasit, the group accuses Ms Yingluck’s administration of corruption, ignoring insults to the revered monarchy and being a puppet of Mr Thaksin. The rally was being held at Bangkok’s Royal Plaza, a public space near Parliament that has been used by protesters in the past. Police allowed protesters into the site, and two roads leading to it were open. But in an effort to control access, security forces erected concrete barriers on another road leading to Royal Plaza. When between 50 to 100 protesters tried to break through one of the barriers, a contingent of around 500 police fired tear gas and beat them back with batons. While Pitak Siam is a newcomer to Thailand’s protest scene, it is linked to the well-known “Yellow Shirt” protesters, whose rallies led to Mr Thaksin’s overthrow. The same movement later toppled a Thaksin-allied elected government after occupying and shutting down Bangkok’s two airports for a week in 2008. Mr Thaksin remains a divisive figure in Thai politics. The Yellow Shirts and their allies say he is personally corrupt and accuse him of seeking to undermine the popular constitutional monarch – charges Thaksin denies. Ms Yingluck was taking Saturday’s rally seriously. Her Cabinet invoked the Internal Security Act on Thursday in three Bangkok districts around the protest site, and she later addressed the nation to explain the move, citing concerns of violence. The security act allows authorities to close roads, impose curfews and ban use of electronic devices in designated areas. Measures began taking effect Thursday night, with police closing roads around Yingluck’s office, the Government House, and placing extra security at the homes of senior officials, including the prime minister. National police chief spokesman Maj. Gen. Piya Uthayo said Friday that 16,800 police officers had been called in from around the country to provide security for the rally. Mr Boonlert, the protest group’s leader, is best known for his role as president of the Thailand Boxing Association. His name is unfamiliar in the anti-Thaksin protest movement, but his message appears to have resonated with Yellow Shirt supporters who have laid low in recent years after Yingluck’s party won the last elections. Analysts said they did not view the protest as an immediate threat to Ms Yingluck’s government, but were watching it closely. “Anytime you have tens of thousands of people converging, assembling in a central Bangkok location, it becomes a government stability concern,” said Mr Thitinan Pongsudhirak, a political scientist at Bangkok’s Chulalongkorn University. Thailand has been gripped by bouts of political instability since 2006, with Mr Thaksin’s supporters and opponents taking turns to spar over who has the right to rule the country. The most violent episode came in 2010, when Mr Thaksin’s “Red Shirt” supporters led a two-month occupation of central Bangkok to demand the resignation of an anti-Thaksin government. The protests sparked a military crackdown that left at least 91 people dead and more than 1,700 injured. Mr Thaksin has lived in self-imposed exile since 2008, when he jumped bail to evade a corruption conviction and two-year jail term. He retains huge popularity among the rural poor, who want to see him pardoned and returned to power. But he is reviled by the urban elite and educated middle class, who see him as authoritarian and a threat to the monarchy. Buoyed by Mr Thaksin’s political machine, Ms Yingluck was elected by a landslide victory in August 2011. She initially was criticised for her lack of political experience – she was an executive in Shinawatra family businesses – but has won praise for leading the country through one of its longest peaceful periods in recent years.